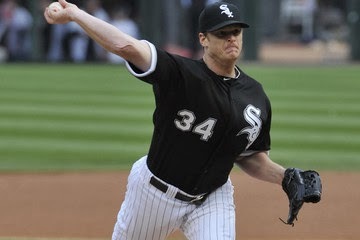 The Braves have inked Gavin Floyd to a 1 year deal. A friend and reader texted me asking who the heck Gavin Floyd was. Honestly, I had no idea so I did some digging. The deal for Floyd is a $4M one year deal that pulls him in as a FA out of the White Sox. No wonder I didn't know the guy, he's in the AL, the place where good pitching goes to die. Unless you are named Verlander. Moving on. The move is obvious, Floyd is meant to take over the seasoned right-handed veteran role that Tim Hudson provided the Braves last season. He's a 30 year old pitcher, a 70-70 record, a kid out of Baltimore, MD, and a 4.48 ERA in the DH league. That's probably akin to a 3.98 ERA in the NL. He's spent 7 years with the White Sox, during that tenure he's been able to rack up 4 seasons of 30+ starts, and one season of 29 starts. Last year he was put on IR with a Tommy John injury, so the Braves will be getting him off of that surgery. He can put up 190+ innings a year when he's healthy, no problem. Also, he's a decent strikeout guy with a 7.1 K/9 ratio. Basically it's a 1-year value play tryout for a guy coming off a surgery with little downside. For $4M plus another $4M in incentives, the Braves are getting a pitcher who is guaranteed to play hard for the extra cash, and a guy that will fit nicely into the 3-4-5 spot of the rotation. Now, what does this mean for the Ace discussion? In my mind, you know you have 3 solid starters, Medlen, Minor, and Teheran. Now you have Floyd. You want to add Beachy back if he's healthy. That's your 5 right now. If you make a trade for Price, you're going to have to deal one of those guys back, otherwise you've screwed up your rotation. Yes, you want depth, but that's why you have guys like Alex Wood and David Hale in the wings. I think it's still possible, but I'm starting to believe that like the Dan Uggla trade, the mythical Ace trade is just that. A Myth.